Reuters – now Thomson Reuters – pioneered the use of computers and global networks in the financial trading markets, thereby helping to create an industry that has contributed to the reshaping of our lives far beyond the financial community. The history of Reuters has a Victorian origin. The company was founded by Paul Julius Reuter, a German immigrant, and started life as a business news agency before expanding into general news. Reuters history shows the agency exploiting, as few other companies had done, the rapid spread of Samuel Morse’s revolutionary device, the electric telegraph, arguably the early forerunner of today’s internet. By the end of the nineteenth century Reuters, capitalising on the growing demand for news stimulated by the telegraph, was playing an influential role in the affairs of the British Empire. The Reuters story continues with the company falling on hard times after the Second World War, as international trading markets all but collapsed. The arrival of the electronic age in the 1970s, however, ensured Reuters enjoyed a new lease on life with a computerised service called Monitor, designed to distribute real-time foreign exchange quotes, and later, information from other markets. Meanwhile, several American companies had developed similar systems for the US stock markets and, before long, receiving real-time market quotes, from all trading markets, on desk-top terminals had become the norm for traders and investors, as it is today. Reuters history demonstrates how the Monitor system transformed the foreign exchange market and in the process, transformed Reuters, turning it from a news agency with an interesting sideline in computer systems to an international information powerhouse. 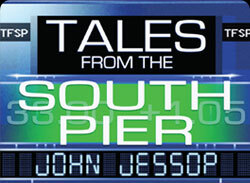 In Tales from the South Pier, John Jessop, a veteran of the financial information industry, recalls those early days in a memoir of compelling interest, laced with amusing anecdotes, written with the perspective of an industry insider and the perception of an eye-witness. Featured in the book, beside the history of Reuters, are other pioneering companies in the real-time information business such as Quotron,Telerate, Bloomberg, Dow Jones, among many others. Some of the companies fell by the wayside, usually victims of the rapid advances in communications technology, but Thomson Reuters (Reuters merged with Thomson’s financial information division in 2007) remains a leader in what has become a multi-billion dollar industry.